Don’t they say that the surest path to discovering a place’s culture runs through the stomach? Our Ljubljana locals feel the same and they’re eager to share their favorite spots for breakfast, lunch, dinner, casual spots, fine dining, traditional kitchen, ethnic cuisine and everything in between — all without breaking the bank. When it comes to the best food in town, you’re in safe, expert hands with these restaurants. “FTP @ Technological park” is a bistro in Ljubljana that always makes me happy. I love their daily options and low-carb lunches. Try their romantic Šabesa. 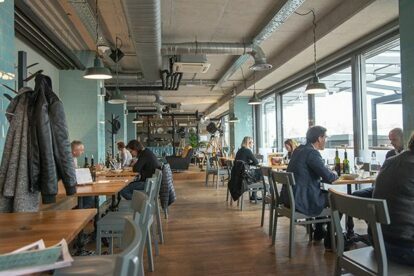 “Gostilna Dela” Ljubljana is a social project that gives people with fewer opportunities the chance to work in a restaurant. One word: yummy! “Klobasarna” Ljubljana is a small, cosy place that I like not only for the Slovenian cuisine, but especially for their specialization in Carniolan sausage.